we modified a video player to play sequences of Street View shots in sync across three screens, like the Tour de France flipbooks we created in 2008. It worked! Playing back the panoramas like a flipbook made it feel like we were zooming through the streets of the world. The wood gazebo was a bit awkward to carry around, so Ji Lee, a mechanical engineer on the team, offered to design a steel frame that we could disassemble and take to conferences. We finished it just in time for Google I/O in June of this year. We wanted to try visualizing other cool geo displays, so in July, Dan Barcay, one of the engineers on the Google Earth team, modified a Google Earth client so that it would synchronize views across multiple computers. The effect was pretty stunning: all of a sudden, flying around in Google Earth really felt like flying, and exploring the ocean trenches was like piloting a submarine. When you splashed through the sea surface you cringed slightly, expecting to get wet. You could even command your own lander down to the Moon or Mars. 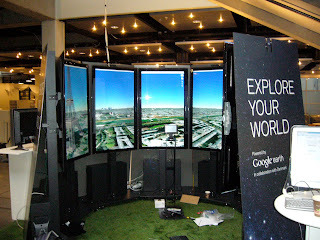 It was amazing to all of us how much more impressive Google Earth felt when we were surrounded by screens and able to turn our heads to look around (and even walk around). It felt more like a ride than a computer program, something between an observation-deck and a glass-walled spaceship. As a result of this totally seamless, immersive experience, we decided to name it the Liquid Galaxy. With the Liquid Galaxy, we could fly through the Grand Canyon, leap into low-Earth orbit, and come back down to perch on the Great Pyramid of Giza without even breaking a sweat. It's still a 20% time project for us, but we're excited about the Liquid Galaxy and we're working hard to improve it. And we still love bringing it to conferences so that more people can try it out. We just finished setting up our latest creation at the COP15 conference in Copenhagen. Hopefully we'll see you there, at AGU this December, or in one of the Google offices with a Liquid Galaxy. Back in June of 2008, some of my fellow engineers and I got to thinking: how could we recreate the experience of seeing the impressive imagery from our geo products in a more seamless way? We scrounged some spare Linux workstations, and in our 20% time we modified a video player to play sequences of Street View shots in sync across three screens, like the Tour de France flipbooks we created in 2008. It worked! Playing back the panoramas like a flipbook made it feel like we were zooming through the streets of the world.